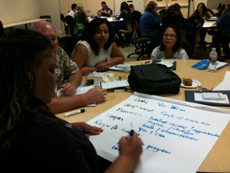 Consumer Action facilitated a day-long, financial literacy train-the-trainer workshop for Orange County non-profits. Just a few weeks later, on Sept. 25, Consumer Action’s Audrey Perrott and Nelson Santiago facilitated a day-long, financial literacy train-the-trainer workshop for Orange County non-profits. Leticia Mata, Assistant Vice President of Community Education and Development at Orange County’s Credit Union, provided free space for the training at the credit union’s Santa Ana headquarters. Close to 50 non-profit representatives including those that serve disabled, new immigrant and low-income populations participated in the training. Sahara Navarro, who said she plans to request additional Consumer Action trainings, wanted the first one to cover the basics: Banking Basics, Money Management and Good Credit. She noted that just days earlier the Bank on Santa Ana campaign was officially launched and that the MoneyWi$e financial literacy tools would complement Bank on Santa Ana’s efforts to bring unbanked populations into the financial mainstream. At the training Santiago and Perrott presented the Good Credit and Money Management modules and answered questions about related issues currently facing community agency clients. For example, Santiago shared information about the recently enacted CARD Act reforming the credit card industry. He provided participants with copies of Consumer Action’s new fact sheet outlining new credit card provisions, and reminded them that consumers would have to continue to monitor credit card statements closely for unexpected changes since most provisions won’t become effective until Feb. 22, 2010. Perrott engaged participants in a discussion about the best ways to stay on track with money. She provided substantive information on how to teach clients to budget, save, and reach short and long-term goals. During her workshop presentation, Perrott divided participants into small groups and asked them to work on finding solutions for consumers experiencing a variety of money problems. Training attendees also participated in an interactive exercise in which they created plans to help various populations overcome barriers to saving. During the afternoon session, Santiago allowed the participants to take a stab at presenting the Banking Basics materials. “One of our goals was to help people feel ready to provide their own MoneyWi$e workshop, and this group did a wonderful job presenting,” he said. Participants were provided packets that included PowerPoint slides, slide notes, brochures, leader’s guides and relevant supplementary information. Five groups were assigned a small section of the workshop to review, prepare, and then present to the class. The exercise gave participants an opportunity to become more familiar with the MoneyWi$e materials, learn from the wealth of knowledge in the class, and also reflect on the best ways to present to their clients. Encouraged to use their creativity, some of the participants employed improvisational theatrical skills to demonstrate the best way to comparison shop for bank accounts. Other participants posted drawings of oversized checks on the wall reminding others of the correct and incorrect ways to write checks. The afternoon session also included a tour of Consumer Action’s web site. Participants learned about where to find publication order forms, where to download camera-ready copies of brochures and where to read the latest consumer news. They also learned about how to participate in Consumer Action’s advocacy efforts through the organization’s Take Action page. Santiago showed participants the areas of the web site where they can find current legislation, Consumer Action’s legislative positions and sample letters in favor or against particular legislation. Santiago also demonstrated how, by entering a zip-code into the Take Action page, consumers can obtain the names and contact information of their state and federal legislative representatives. Sahara Navarro said she was thankful not only for the chance to bring the MoneyWi$e training to Orange County, but also for the opportunity to increase awareness of the Earned Income Tax Credit (EITC) and to increase membership in the Orange County Financial Stability Alliance (OCFSA). Over the past four years, Orange County United Way’s EITC campaign, in collaboration with several community partners, has helped a total of 7,171 taxpayers obtain $9,597,189 in federal returns of which $4,550,634 were a result of the tax credit. “Although, these are great accomplishments,” Navarro said, “more work is needed to continue moving toward financial stability in the area.” Navarro also pointed to another benefit of having Consumer Action’s free MoneyWi$e program available in Orange County: it provides local agencies an opportunity to leverage resources at a time when funding sources—not to mention gas money for trips to Los Angeles—are limited. MoneyWi$e is a partnership between Consumer Action and Capital One Bank. The Orange County training was made possible by Consumer Action’s Managing Money Project, founded with a cy pres award from the Griego v. Rent-A-Center class action settlement.